Today, I’m reblogging a reblog from a blog I love. Can I do that? Are there rules? Well, I am. It’s just too good to not share with as many people as I can. It’s a topic of concern with my own self and I’m hearing nudges from other like-minded souls that it’s theirs, too. I will write more on it later, but for now, savor the words of Heather and Mark Nepo. I harrumphed, and then agreed. Yet another way to quit deeper, right? I hope you get as much from this as I did. Unfortunately, we are encouraged, even trained, to get attention when the renewing secret of life is to give attention. From performing well on tests to positioning ourselves for promotions, we are schooled to believe that to succeed we must get attention and be recognized as special, when the threshold to all that is extraordinary in life opens only when we devote ourselves to giving attention, not getting it. Things come alive for us only when we dare to see and recognize everything as special. It leaves us with these choices: fame or peace, be a celebrity or celebrate being, work all our days to be seen or devote ourselves to seeing, build our identity on the attention we can get or find our place in the beauty of things by the attention we can give. –Mark Nepo, The Book of Awakening. Mark Nepo is a cancer survivor, a poet, and philosopher. He’s not a Christian, nor is he in recovery that I’m aware of. But God speaks to me a lot through his writings. BAM: When we feel the need to BE noticed, turn it around and instead, BE the NOTICER. 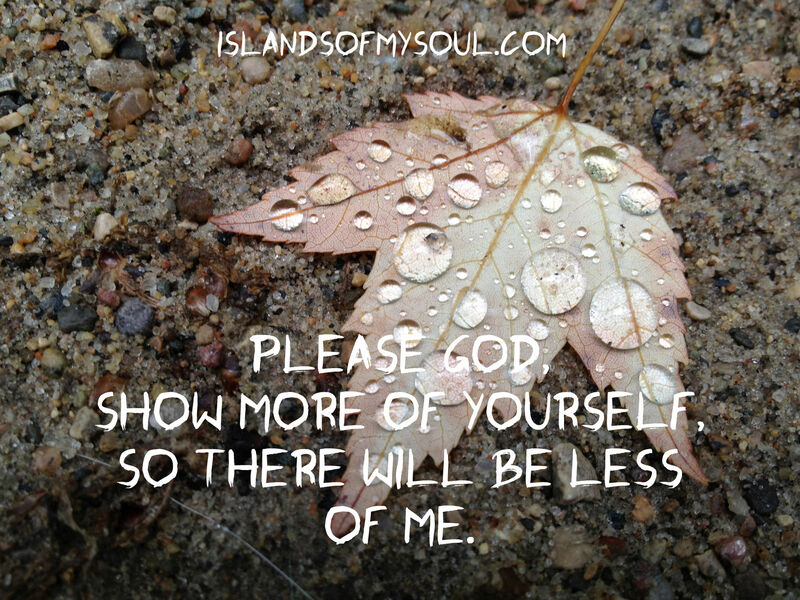 Show more of yourself, so there will be Less of Me. Love your words. Almost always opens up an hour or more thought process for me. Glad you do this.. Thank you, Kurt, for taking time to read the words. Be grateful for Heather and Mark Nepo today, though! I was totally inspired by them. . . This has my mind whirling and swirling with so many thoughts now. I shall let this marinate and I thank you for sharing such a thought provoking post. For me, when I’m all ancy about this and that, I refocus and reset by BEING loving instead of seeking love. By radiating love and compassion to the world rather than pulling it in towards myself. So this post resonates with me, reminds me to stay on track. Thought provoking! For me, this speaks to who I be, not what I do. The essence of me is my being, not my Doing. Thanks for sharing!